capacities and potential. My community works steadily on many aspects of personal, neighborhood, organizational, and cultural change so that the hopes expressed by people and their allies have some concrete impact on the structures of society. I stitch together symbols and patterns of the longings, joys, struggles, and beauty of thousands of people who are learning how to bring the gifts of every person to life and to create a more inclusive community by doing so. This work has affirmed in me the belief that all people have gifts to bring, and that the fabric of community is strengthened when we incorporate the capacities of “labeled” people into the civic life of all. The quilts serve as metaphor and example of the weaving together the colorful interests of many into tapestries of shared concern. Consequently, the quilts display vibrant collections of diversity—fabrics, patterns, and identities—from people of many cultures finding a way toward an aesthetic that expresses harmony, balance, proportionality, rhythm, vitality beauty, and joy in the process of creation. 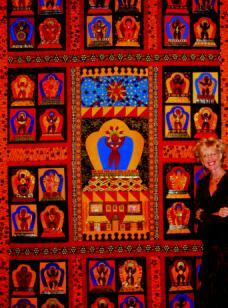 The method of making these quilts engages people in co-creating visions and platforms for change. The experience of making these artworks with thousands of people confirms for me the potential of each individual to be a fundamentally creative being. Everyone is an artist when involved in the construction of their world. The creativity, imagination, and contributions of all people are needed to revitalize and restore community. Growing up in Atlanta during the 1960‘s civil rights movement, I was influenced by Martin Luther King, Jr.’s call to remember that “we are all tied together in the single garment of destiny, caught in an inescapable network of mutuality.” Dr. King’s Beloved Community is a global vision, in which all people share in the wealth of the earth. Racism and all forms of discrimination, bigotry and prejudice are transcended in an all-inclusive spirit of sisterhood and brotherhood. Legal and civil rights create the foundation for equal opportunity; the vision of the beloved community, however, invites personal and social relationships created by love. Relationships cannot be legislated. Dr King describes this agape love as an “overflowing love seeking to preserve and create community.” Undoubtedly, the people I know benefit from and contribute to this art of relationship building.